Hey mate, here ya go, he mentions it in the vid. looks like it has been thoroughly ruined to me... basically they have taken a vehicle that could have easily sold 1/2 as many as a Jeep wrangler and easily doubled JLR's production numbers and profit and made it into a caricature of what it was. At best this is a good replacement for the LR4 since the D5 has failed in the marketplace. I was really hoping for a modern replacement which would be available in the US. Defender got banned from states due to how it was, it needed to change as already discussed many times above. 20k average sales was not sustainable. 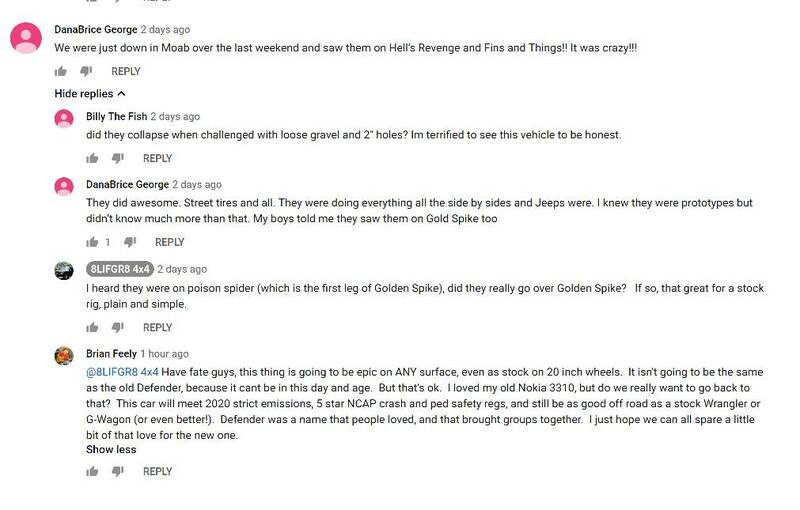 Comments from vid below, people are starting to see how capable it is at MOAB, a lot of these trails don't mean anything to me but most likely mean things to some of you US boys. I'm going to have to get on YouTube and see what these trails are like. Rest assured, the trails mentioned are no joke. The Googles and The YouTubes will show you. The "street tires" comment is less surprising as Disco 5's run the same trails with their crap OE Goodyear 20" wheel 55-series street tires. Sandstone "slickrock" is not slick unless it's actively raining or has very recently rained. It's basically rock made of the raw materials for medium-grit sandpaper. It got its name 120+ years ago when people tried to ride it on ponies with iron horseshoes, which would be very slick indeed. Line choice with sufficient wheel travel and torque management (for when wheels are off the ground), ground clearance, and torque are much more critical these days than tire choice. The Defender was removed from the US market because it sold under 500 units in its last year (1997) and that wasn't enough to justify modifying it to meet crash safety standards, specifically the new airbag regulations going into effect in 1998. Unfortunately the Jeep Wrangler was a far better value at the time - same capability at half the price, which is why the Defender sold so few. Notorious LR reliability reputation didn't help. Today, that margin is a lot slimmer - if you want a LWB Wrangler Rubicon that's a nice place to be inside with all the bells and whistles, you're paying over $50K off the lot before tax and title. The 2019 MOAB edition starts at $51K. Fortunately for Land Rover, Jeep's reliability is in the crapper and LR's is on the rise, and America's taste for premium SUVs is so far insatiable. With the new Jeep Gladiator priced at $35K to $45K the expectations for the new Defender are set. 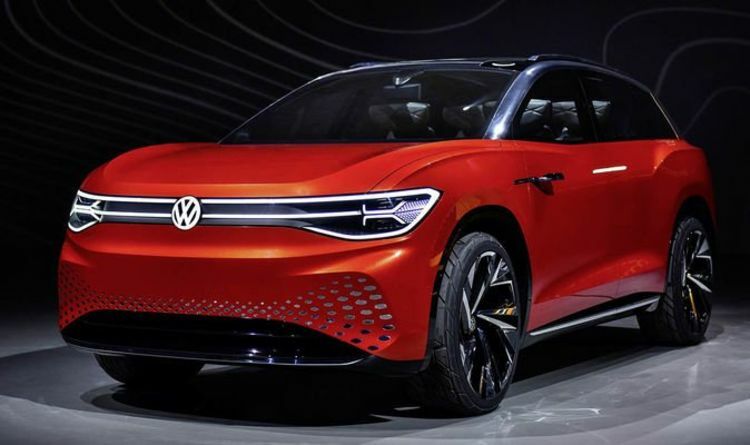 VOLKSWAGEN could manufacture a rugged all-electric car which would rival the Land Rover Defender. Given the limited operational profile of pure EV vehicles and Land Rovers need to make a statement, Land Rover needs to differentiate themselves from the pack by offering a Hydrogen Fuel Cell Defender. I'm disappointed at the people who say that the defender can't be made to look like a defender because of safety ratings, blah blah blah. Nobody looks at a jeep wrangler and says, "hmmm, is that the new Kia?" But that's exactly what LR has done, even when the camo comes off. Jeep doesn't sell because its efficient and comfortable, it sells because it's a jeep. That means solid axles, body on frame, open air top, folding windshield. Jeep took the time to keep the essence of the vehicle and bring it up to safety standards. People have been wanting the defender in the US for a long time, but LR just didnt listen. I'm not too impressed with what I see so far. There are so many other, cheaper vehicles that are capable. I want to see a DEFENDER, not a new Honda pilot. That said, I want this thing to be badass, just like I want the ford bronco to be! Agreed, I think there are trucks running on it allready? Im sure they are looking into it, hopefuly MLA can be adapted to suit if its becomes viable. There is a hydrogen fuel thread on the AU LR forum, pretty interesting. Jeep also has a 1 star safety rating, in its current incarnation, its living on borrowed time as far as worldwide sales are concerned. Even Jimny is 3 stars. Don't get me wrong the jeep is definitely a good thing for what it is. If you look into the facts of what Land Rover had to change to make the vehicle saleable worldwide as posted recently above, what you see is the result of considering all factors I'm sure and insuring it will sell for years to come in all markets. Safety efficiency Comfort capability ruggedness, they had to juggle everything. From what I can see so far what they have done is not very dissimilar to the g wagon upgrade. 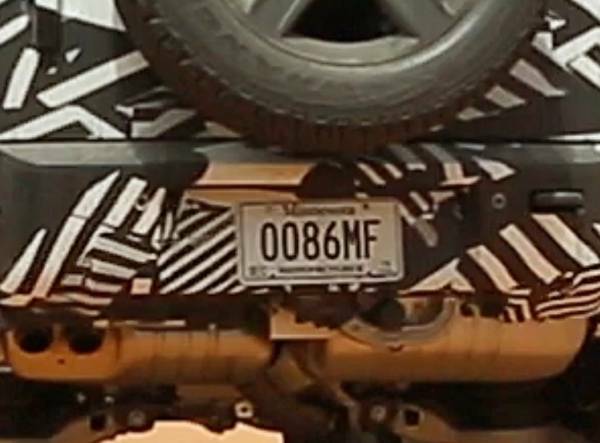 Once the camo comes off I'm sure they will make the defender look pretty tough and JLR are on record as saying it will leave the g wagon in the shade so I guess that's saying something. If the comments of people that have seen the MOAB defender are anything to go by there is hope yet. 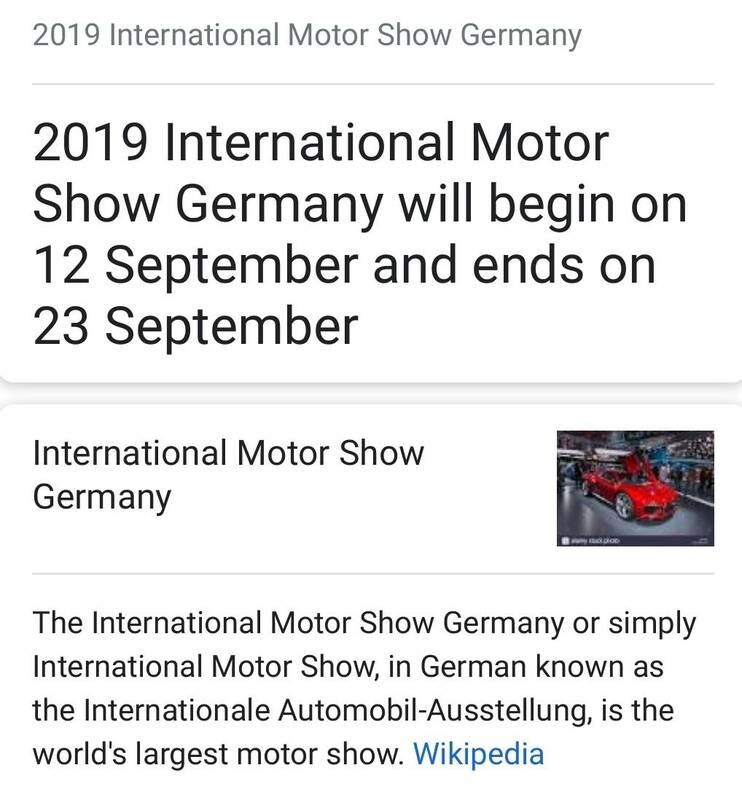 Looks like Frankfort motor show, my guess is they will do outside and invite everyone attending, they have done a big launch event outside motor shows for most of the recent new models. 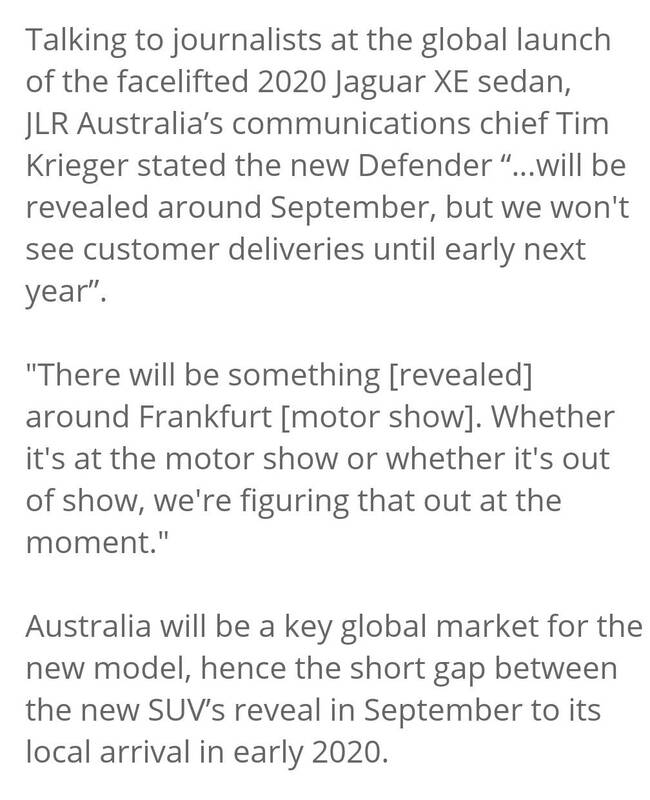 Australia will be a key market!!?? HA. Rover handed that to Toyota over 30 years ago. Go to the edge of the Simpson Desert with one of these new Defenders and a brand new Toyota 70 series. Park them next to each other, outfit them with everything you need to cross. No one would pick the Defender with independent air suspension and low profile tires. The Defender might sell well, picking up LR4 owners but that is it. Jeep buyers are don't care about '1 star' ratings. They are looking for a vehicle that can be significantly modified, accessorized, configured as a hardtop and convertible, a outdoor statement, etc. Attributes that don't even enter the LR thinking. Here in Colorado the ratio of Jeeps to LR's is probably 100:1. If LR doesn't figure out how to increase sales volumes they will be absorbed into another manufacturers group.